Today’s Federal Reserve Decision – Fed Not ImpatientMuch has been made of one sentence in the Federal Reserve’s prior press release in late January: “Based on its current assessment, the Committee judges that it can be patient in beginning to normalize the stance of monetary policy.”Since that Federal Open Market Committee (FOMC) meeting, U.S. economic growth moderated a bit, but the labor market continued to improve. There has been a “strong gain in jobs” and the unemployment rate has now fallen to 5.5 percent, largely deemed to be close to full employment and well below the jobless rate in Canada, Europe and most other developed economies. Moreover, the rate is below the level posted when the Fed began to hike interest rates in June 2004. The Fed sees the risks to the economy as “nearly balanced” with inflation rising gradually over the medium term as labor markets continue to tighten and the transitory effects of oil price declines dissipate. The important “patient” sentence is gone and replaced with a statement suggesting that an April rate hike is unlikely and the Fed will continue its careful analysis of the incoming data. Only two of the 17 Fed officials think the U.S. central bank will not move later this year. In a dovish signal, Fed officials sharply revised down their expected path of interest rates this year and next, consistent with their reduced expectations for U.S. growth and inflation, as well as their reduced estimate 0f the lowest noninflationary unemployment rate. 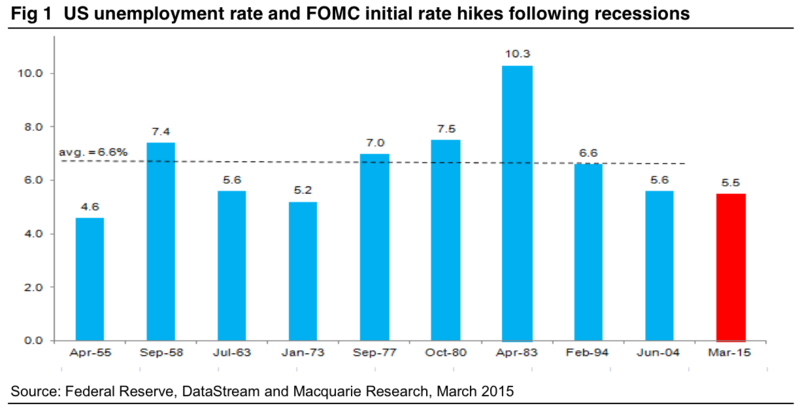 A June rate hike appears to be far from certain. More likely, the Fed will raise rates at the September meeting. Janet Yellen said in her press conference that while the Fed has removed the word ‘patient’, they are not impatient. The central bank signaled a cautious outlook for economic growth and remains reluctant to move too quickly. The fed funds rate, the overnight lending rate between banks, has been in this 0 to ¼ percent target range since December 2008. The last time the Fed hiked rates was in June 2006.